Hello! My name is Jeff Caveney. I live in Chicago. I am an experienced chess player and teacher, but a beginner at go. I really enjoy learning about the game. tapir: Welcome to Sensei's Library! Thank you for the warm welcome, tapir! 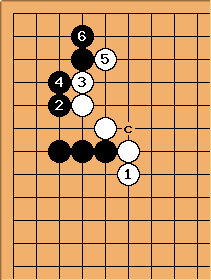 The old joseki was this, with White playing tenuki after despite the cutting point at c. If Black cuts there White treats the stones including and as disposable. rokirovka: I don't get it. Are you saying that all four White stones above and to the left of c are disposable? In that case, Black will have a huge corner and White will only have his two stones below c. White will have sente elsewhere on the board, but what has he gained by playing and at all? Look at it this way. Black spent 4 stones ( - ) to get 11 points of additional territory: less than 3 pts per stone. This is a terrible investment for black. 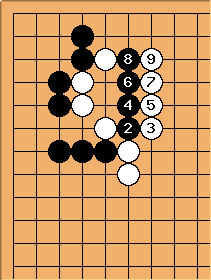 If white gains 10 pts from her tenuki with , then black has regained those 10 pts, so no net change, except that now white's wall is perfected where before it had defects. Essentially, black has fixed white's wall for her.